So Glad We Are Friends!!! Happy Wednesday!!! Do you follow someone on social media and you feel like you really know them? When talking to someone, you say oh yeah my friend recommends this or my friend did this but really you have never met that person. This happens to me all the time. I have lots of friends like that. If I am your friend that way, give me a shout out in the comments and know I would LOVE to be your friend online and maybe even some day in person! This card says it all….So Glad We Are Friends!!! How fabulous is this card?? The Lovely Lipstick and Grapefruit Grove color combination is amazing and oh that shiny foil! YUM!!! I started with a Grapefruit Grove card base measuring 11″ x 4-1/4″. It opens like a book. Next, I took a piece of Lovely Lipstick and ran it through the Big Shot in the NEW Dot To Dot Embossing Folder. I layered this onto the card front! Then using the Stitched Rectangles Framelits, I die cut some of the Sale-A-Bration Grapefruit Grove Foil Paper and Whisper White cardstock. The greeting is from the Incredible Like You Stamp Set from the Occasions Mini Catalog. I stamped it in Lovely Lipstick Ink towards the right side. Then I layered the white rectangle onto the foil piece. Then using the Lovely Lipstick Ribbon from the All My Love Ribbon Pack, I looped a knot and placed it on the rectangles. Then I simply secured the ends on the back with some Stampin’ Dimensionals. Finish off adding more dimensionals so it’s even and I added this to the card front! I finished off the card by adding a few Enamel Shapes from the Happiness Blooms Enamel Dots. It’s just perfect! 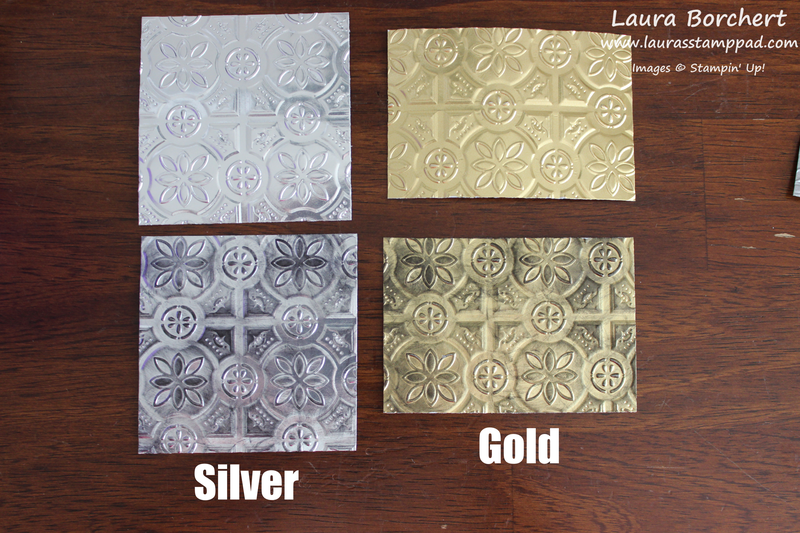 I had to share all of these photos so you could really see how fabulous that foil paper is and the ways it shines! 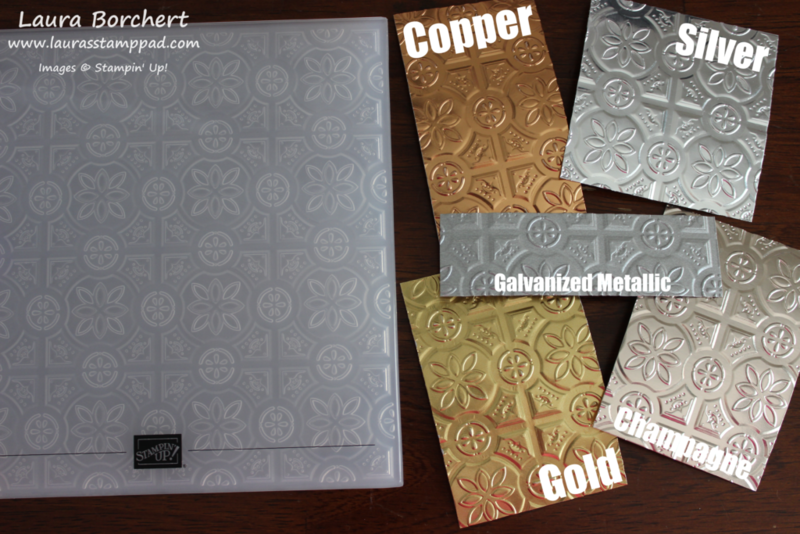 Earn this foil paper for FREE through Sale-A-Bration with a $50 order! Click the supplies for this card listed below to start earning!!! Technique Tuesday – Dashing Deer Duplicates!!! Happy Tuesday!!! You all know what that means! I have a fabulous Technique to share with you today! I’m sharing this fun idea of creating Dashing Deer Duplicates!!! Today I’ll be sharing one card today and then the coordinating one tomorrow!!! Get a sneak peak of it in the video below! For this card, I used Gold Foil, Whisper White, and Merry Merlot paper. The only ink used was Merry Merlot Ink and the only stamp set was the Dashing Deer Stamp Set. I also, used the Detailed Deer Framelits (Bundle & Save 10%). 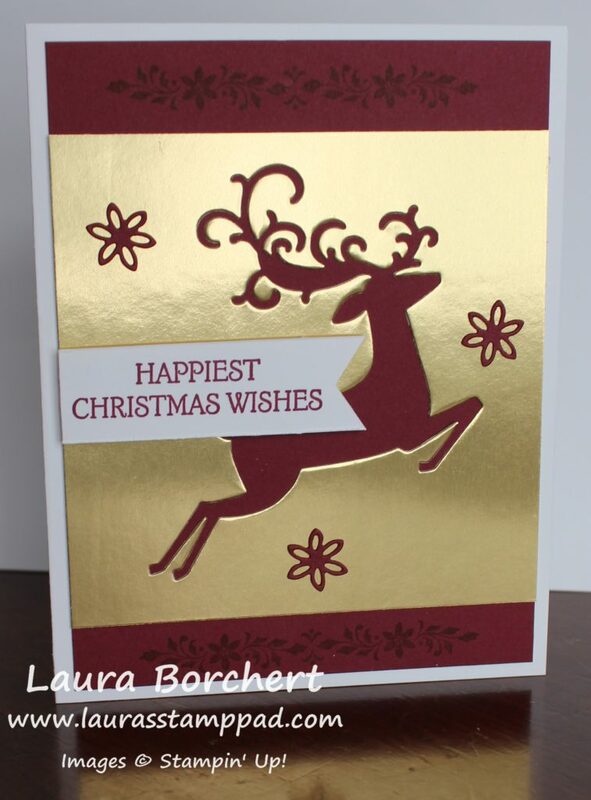 With these products I created this card and then used a similar layout and the die cut deer to create another card. Come back tomorrow for that one! I started with a Whisper White card base which is great for writing on the inside of the card too! 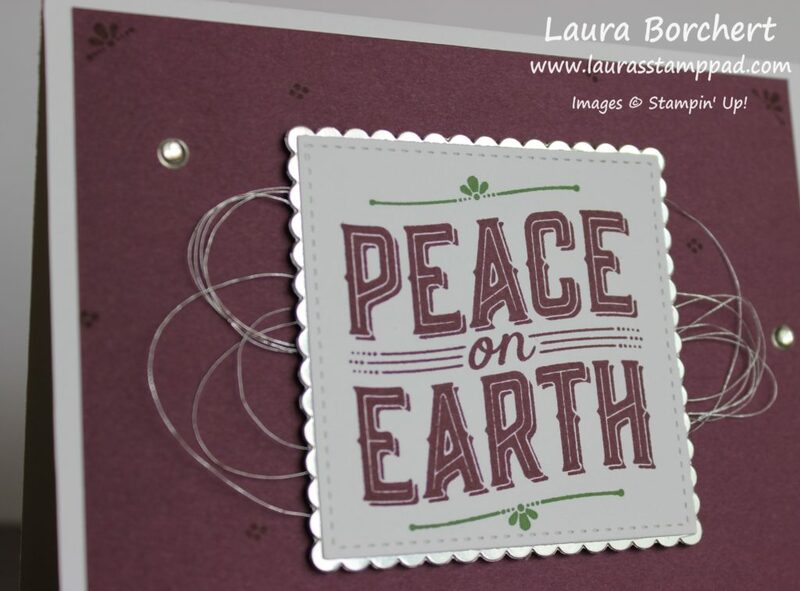 Next, I layered on a piece of Merry Merlot cardstock after stamping the floral image on the top and bottom. The image was stamped in Merry Merlot for that subtle look. Then I took a 4″ x 4″ piece of Gold Foil Paper and die cut the deer out with the Detailed Deer Framelits. I also die cut out a few flowers in Merry Merlot cardstock. BONUS: Stampin’ Up put a few of the flower framelits in the set so that you can die cut multiples at the same time. So I got all 3 of these flowers with just 1 crank through the Big Shot! Using the Fine Tip Glue Pen, I added the flowers around the deer! For the greeting, I stamped it in Merry Merlot from the Dashing Deer Stamp Set. To make the banner tips, I just used the Banner Triple Punch! 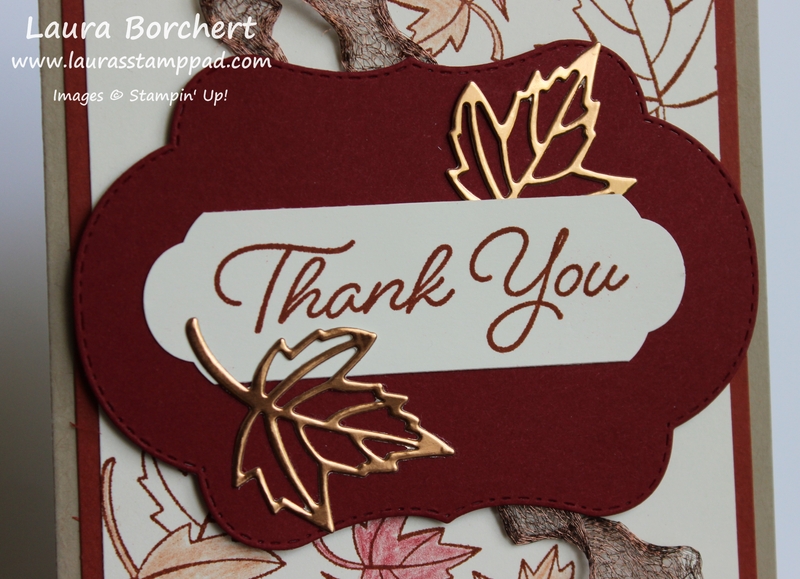 Since I hadn’t used any Stampin’ Dimensionals just yet, I thought I needed to for the greeting! 🙂 You all know how much I love those things! 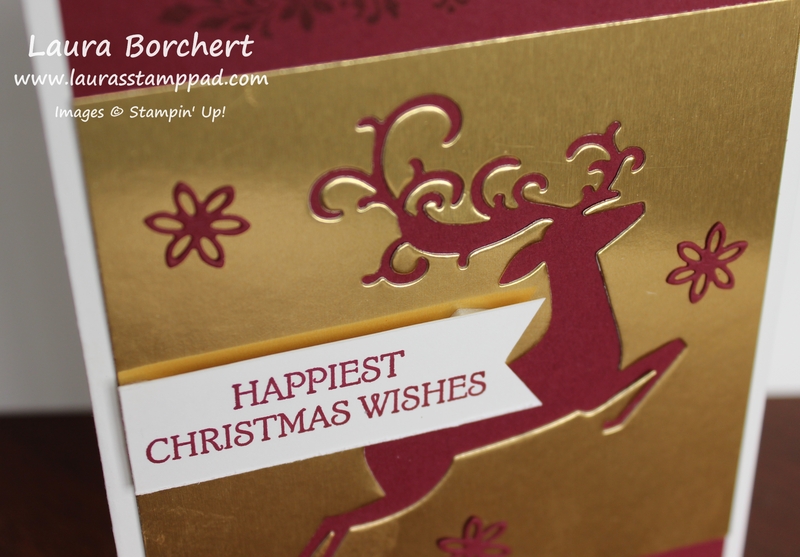 Come back again tomorrow to see how I used the die cut deer to create another card with the same stamps, ink, and paper!!! Happy Monday!!! 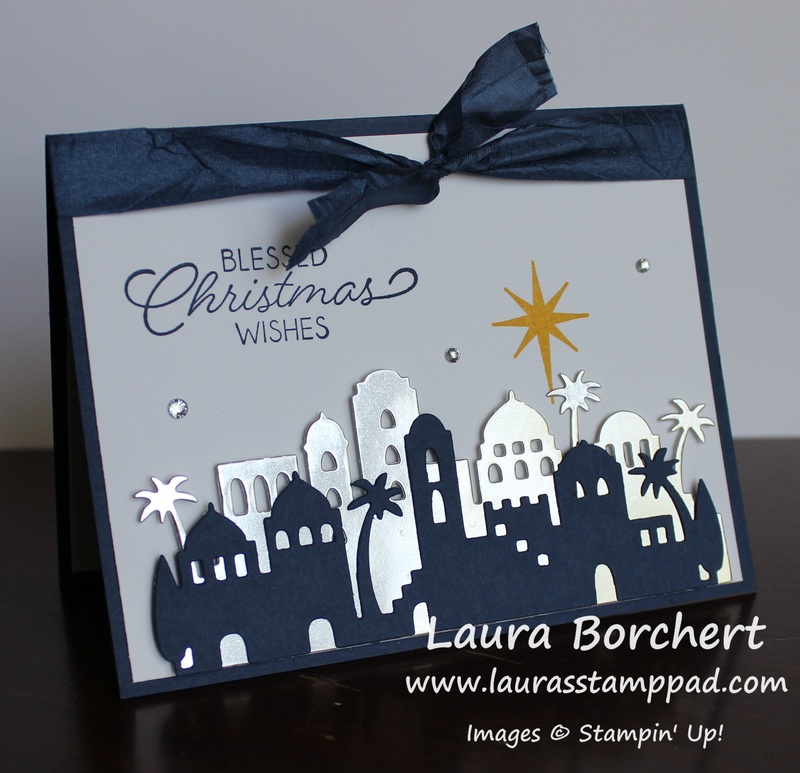 Awhile back I showed you this simple, all stamping card with the Night in Bethlehem Stamp Set! 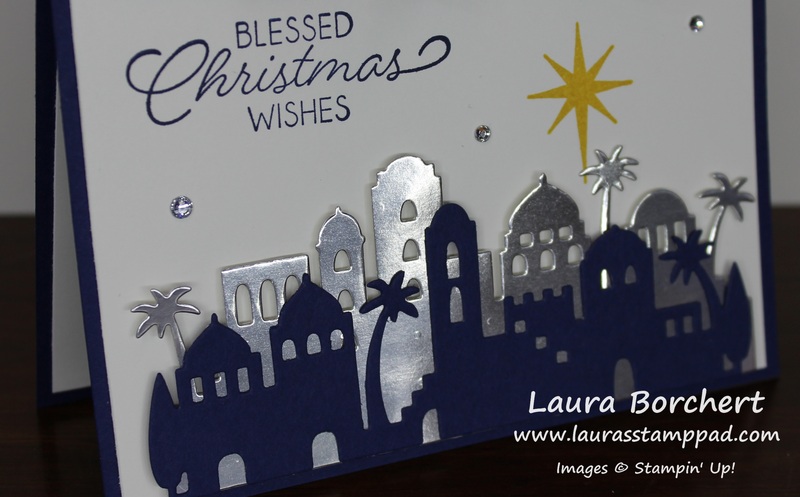 Today, I’m showing this City of Bethlehem “stepped up” card using the coordinating Bethlehem Framelits!!! This card is just stunning with that double layer of the city but does require a little bit more work with using the Big Shot. I started with a Night of Navy card base. Next, I cut two pieces of Whisper White measuring 4″ x 5-1/4″. One piece is for the front and the other is for the inside since Night of Navy is such a dark color so writing on white is better! Before adding the white to the front, I did all of the stamping. This way if I make a mistake I can flip it over or grab another piece. First, I die cut the two villages with the Bethlehem Framelits; one in Night of Navy and the other in Silver Foil Paper. I adhered the two together and then added Stampin’ Dimensionals on the back to add it to the card front. Now for the stamping!! First, I stamped the star in Crushed Curry Ink and then the greeting in Night of Navy Ink. If you wish to stamp before adding the city, you can place it there as a guide, stamp, and then add it. Just go with whatever you are more comfortable with. Be sure that the greeting is low enough to add the ribbon! Next, I added this piece to the card front and tied the Night of Navy Crinkled Seam Binding around the card. To finish it off, I added some Rhinestones for a little more bling!!! I did play around with this one for a while wondering what to add and my spacing. Mary and Joseph just looked so big in front of the city but I was trying to get them in there. I could have put the city up higher and it would have looked more “in the background” but I was happy with what I came up with. Do you ever have that where you spend forever trying to get the placement and idea to all come together?? Let me know in the comments below! Also, let me know if you prefer the simple stamped one or this stepped up version!!! When I first saw the Champagne Foil Paper I fell in love and then I embossed Champagne Foil Paper and my heart exploded!!! So simple but yet very stunning! I started with a piece of Very Vanilla (4-1/4″ x 11″) for a card base. Next, I cut a piece of Fresh Fig (4″ x 5-1/4″) and added it to the front. 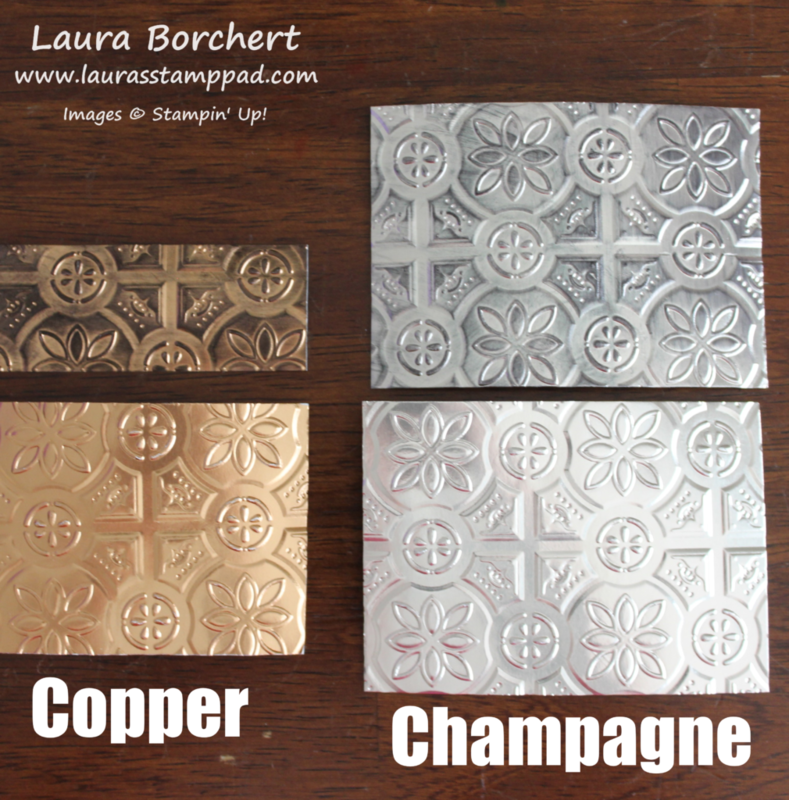 Then, I took 2 pieces of Champagne Foil measuring 1-1/2″ x 3-3/4″. 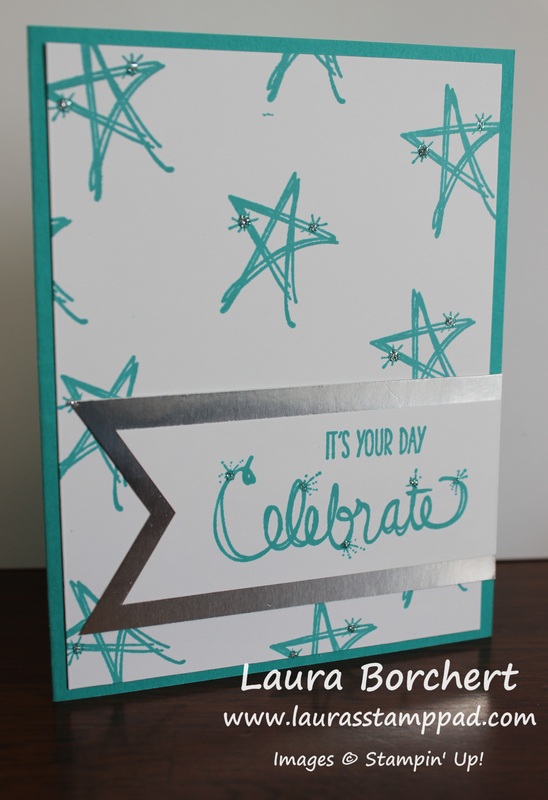 Using the Big Shot, I ran them through in the Oh My Stars Embossing Folder. I added one to the top and one to the bottom of the card front. By placing these one first, I found that my spacing was better. Working towards the middle rather than top to bottom (or vice versa) helped with my spacing more. 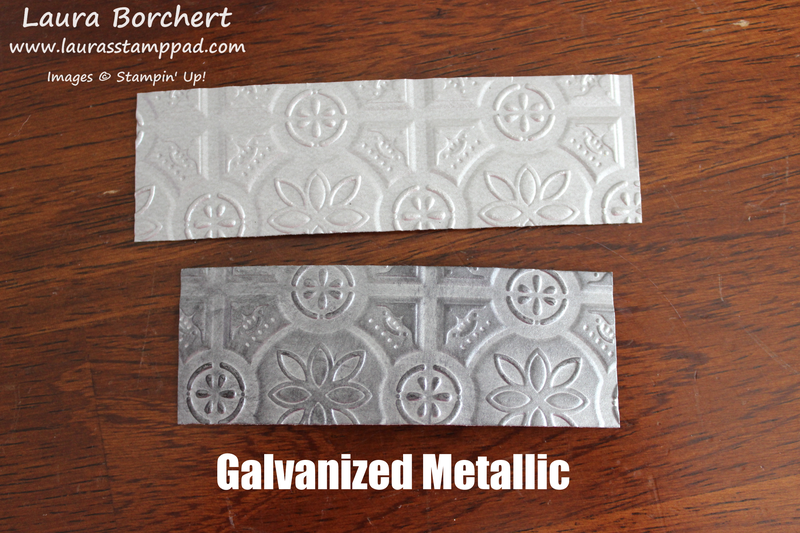 For the greeting in the middle, I cut a piece of Very Vanilla measuring 1-3/4″ x 3-3/4″. Using the Snowflake Sentiments Stamp Set, I stamped the greeting in Fresh Fig Ink. Then using the little scroll, I stamped one up and one down to border the greeting! Technique Tuesday – Adding a Foil Border!!! Happy Tuesday!!! That means I have a fabulous technique for you today….or in this case, it is kind of like a hack! 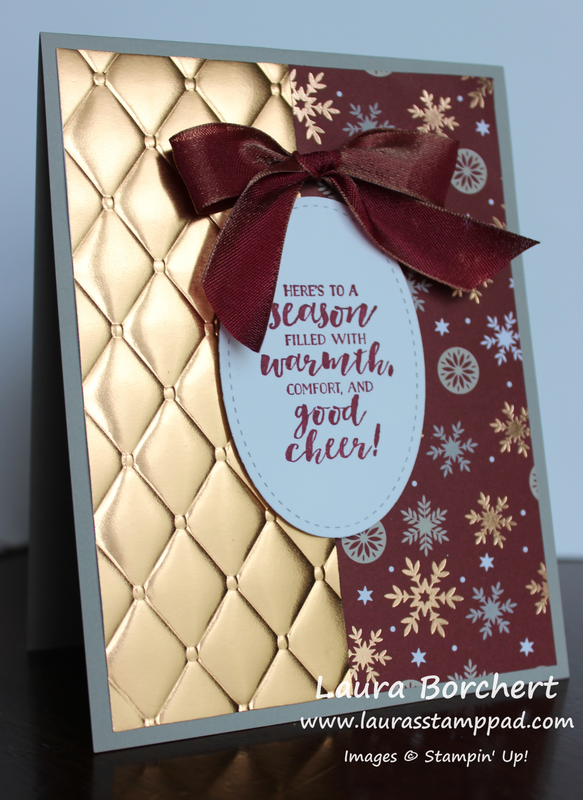 Adding a foil border to your project with the Year of Cheer Designer Washi Tape is simple, less layers than adding foil paper, and more cost effective!!! Woot Woot! 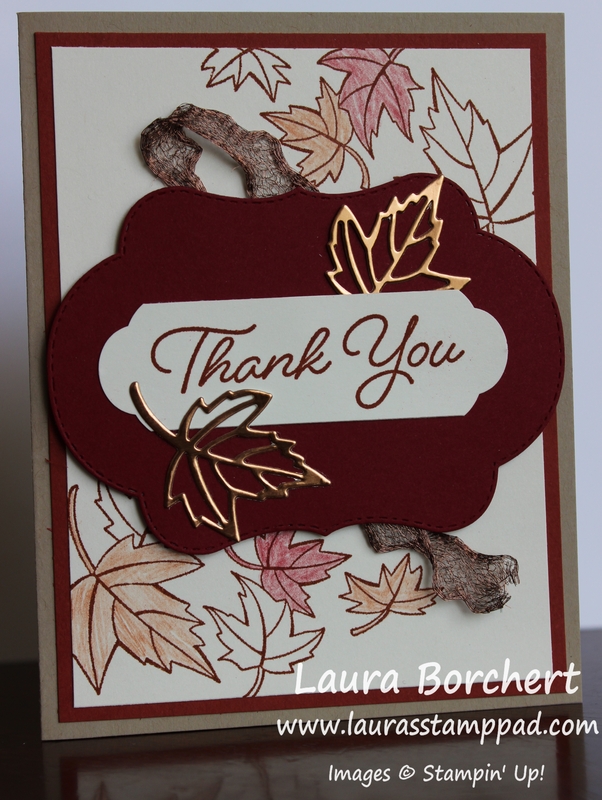 Isn’t this card just stunning and perfect for any Fall occasion?!?!? It was super simple using the Washi Tape rather than cutting a large piece of Foil Paper to cover up most and just allow the border! I started with a Crumb Cake card base. Next, I took a piece of Always Artichoke (5-1/2″ x 2″) and placed it on my card front. You can go ahead and adhere it down and place the Washi Tape next to it or simple place it there as a guide and then add it later. Add a strip of the Copper Washi Tape from the Year of Cheer Washi Tape Pack on the top and bottom. Then you can add the strip of green if you haven’t already. 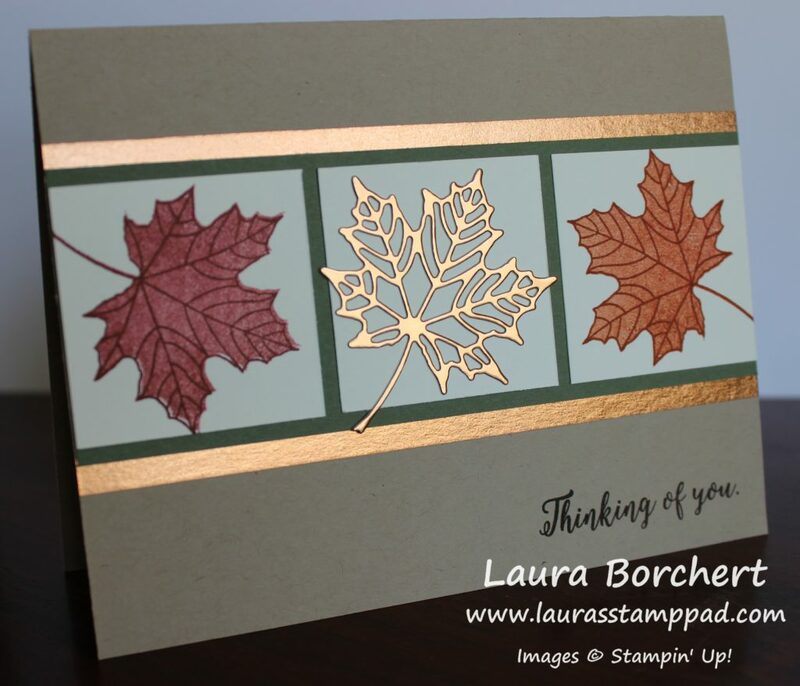 For the leaves, I stamped 2 of them on Very Vanilla squares measuring 1-3/4″ x 1-3/4″ from the Colorful Seasons Stamp Set. I used Cajun Craze Ink and Cherry Cobbler Ink. Be sure to stamp off once on the solid image and then go full strength on the outline image. The center leaf was die cut with the coordinating Seasonal Layers Framelits from Copper Foil Paper. I used the Fine Tip Glue Pen to adhere it. When placing the squares onto the card front, I started with the outside ones making them flush with the edge of the card. Then I added the center one. To finish off the card, I added the greeting at the bottom in Early Espresso Ink! You can purchase the Colorful Seasons Stamp Set at 15% off with the World Card Making Day Special going on till October 10th! Be sure to check out those deals here as well as the Buy 3, Get 1 Free Designer Series Paper Special here. If you would like to see this in action, check out the Video Tutorial below or click here! Be sure to give the video a thumbs up if you liked it and don’t forget to subscribe if you are new. If you would like a notification when I post a new video, be sure to click the bell right next to the subscribe!!! Technique Tuesday – Carols of Christmas Bundle!!! Happy Tuesday!!! 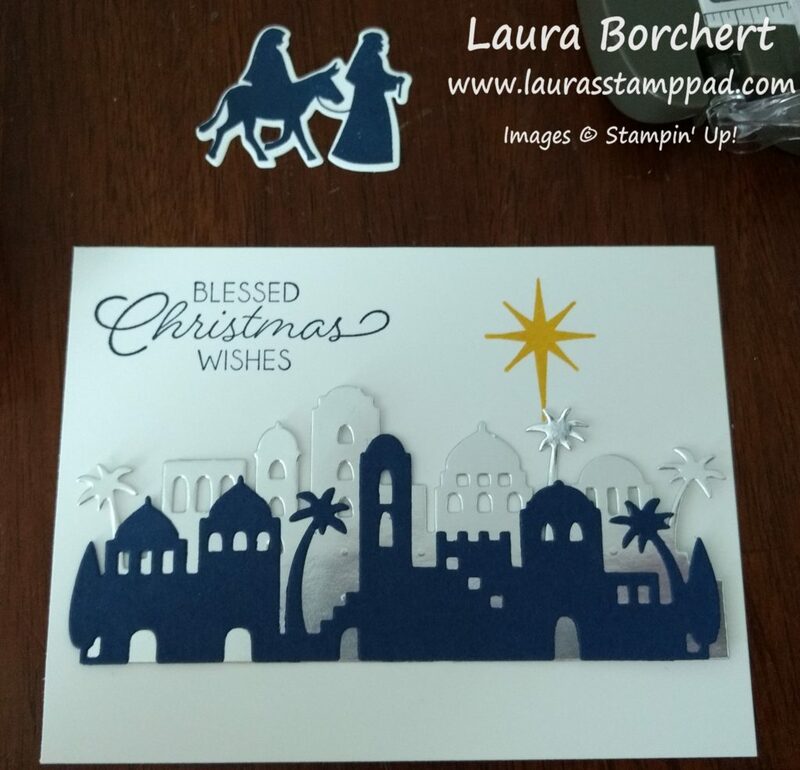 It’s August and Stampin’ Up pre-released the Carols of Christmas Bundle!!! The holiday mini catalog will come out next month but we get to enjoy this amazing stamp set and coordinating framelit….NOW! 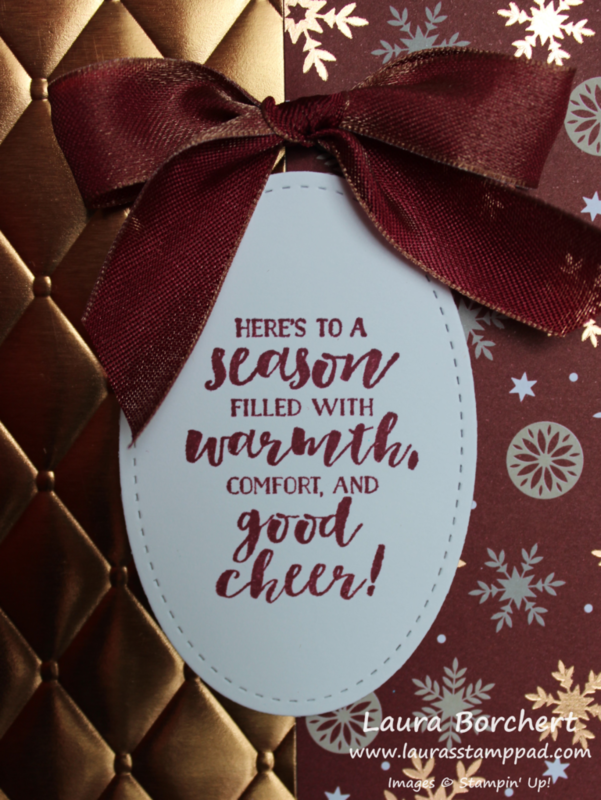 This card is quick and simple and perfect for making multiples this holiday season! I started with a Whisper White card base which is perfect for writing your message on the inside. Next I took a piece of Fresh Fig cardstock measuring 4″ x 5-1/4″ and stamped all over it with the Carols of Christmas Stamp Set. The corners each have the little fan image stamped in them. Then I used the four dots (pointsettia center) to add a little more decoration to the background. Next, I added this layer to the card front. For the greeting, I used the Stitched Shapes Framelits for the Whisper White square. The greeting was stamped in Fresh Fig Ink and then lines with a fan were stamped in Garden Green. There are 2 images like this – one is straight across to use with the Deck The Halls greeting and the other one has a wave to it. I used the wave one to coordinate with the wave in the greeting. All of these images are in the Carols of Christmas Stamp Set. 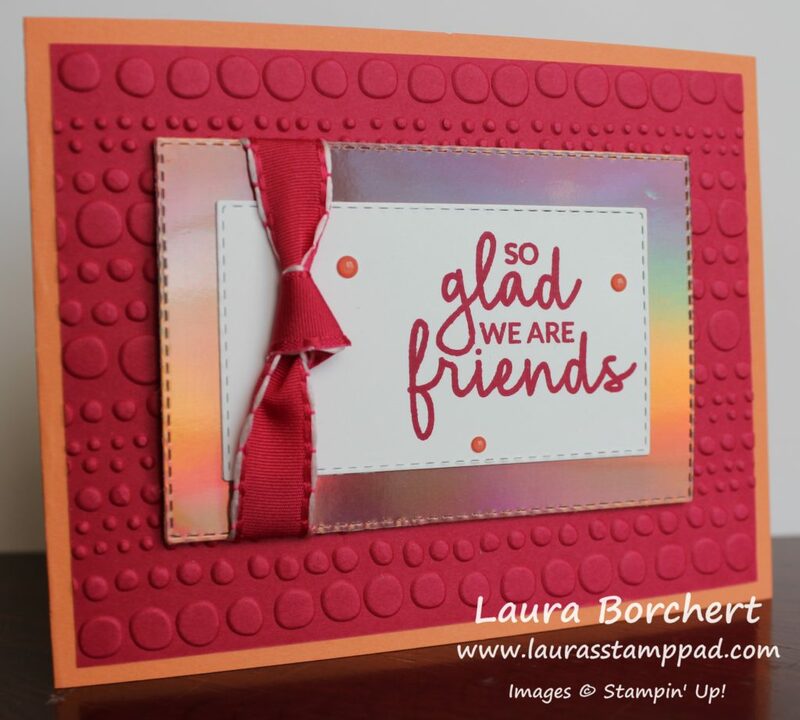 I layered the greeting onto a piece of Silver Foil Paper die cut with the Layering Squares Framelits. Next, I took some Silver Metallic Thread and wrapped it around my finger 8-10 times. Then I slid the thread off my fingers and twisted it in the middle to create a figure 8. 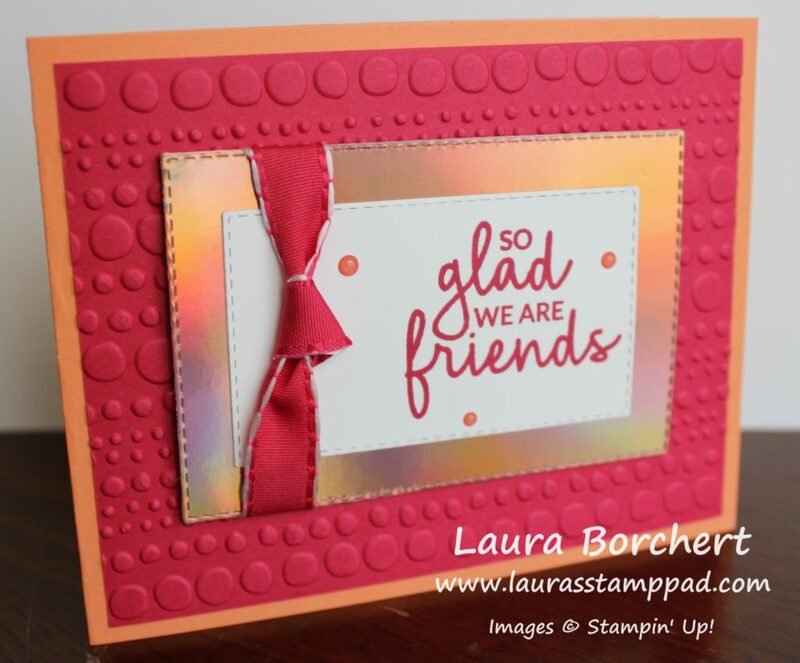 Set the twist down on the back of the greeting and secure it with a Stampin’ Dimensional. Then I fan out the loops and secure them with more dimensionals. Peel off the backs of the dimensionals and attach it to the card front. 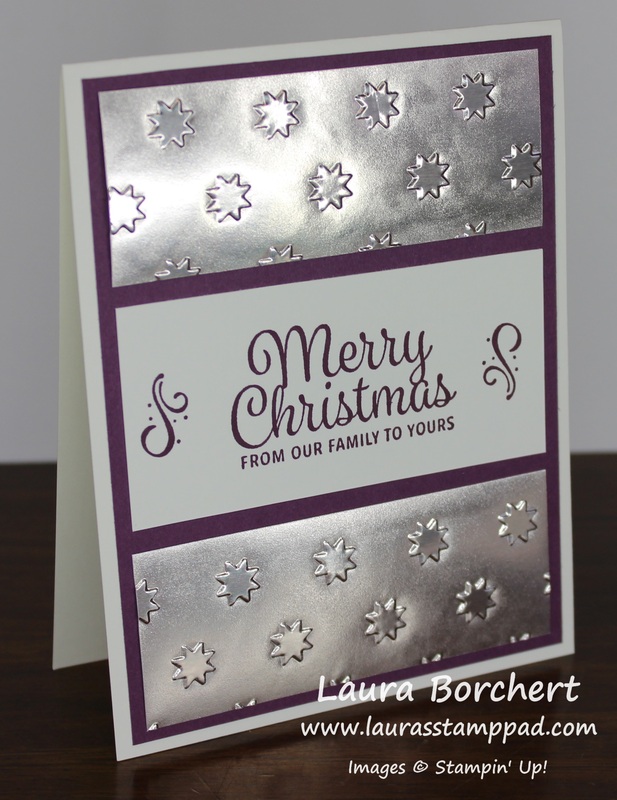 To finish off the card, I added a few Silver Enamel Shapes (or you can use Rhinestones). If you would like to see more on the Carols of Christmas Bundle, check out the Video Tutorial below or click here! Be sure to give the video a thumbs up if you liked it and don’t forget to subscribe if you are new. If you would like a notification when I post a new video, be sure to click the bell right next to the subscribe!!! Stay tuned as I will be posting more samples and fun with this bundle! 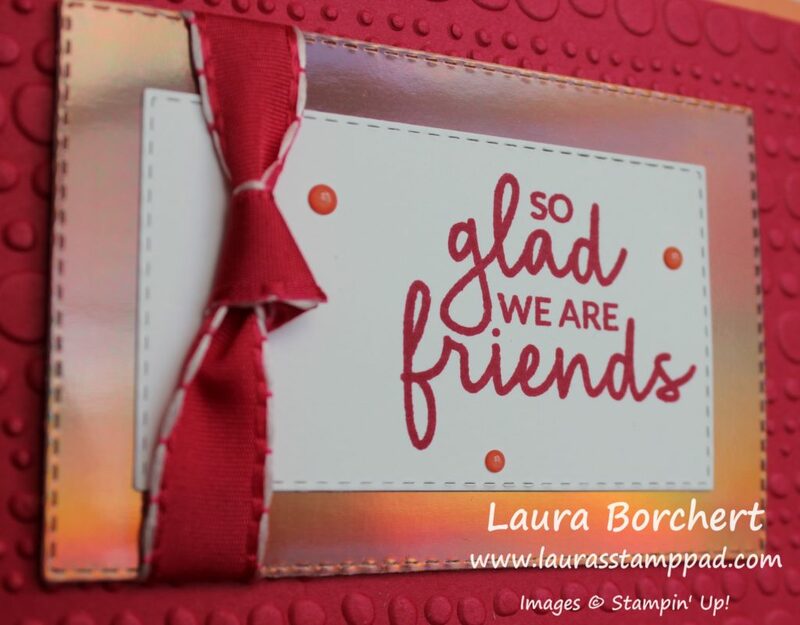 🙂 Click here to purchase your bundle so you can play along and earn Laura’s Loyal Stampers Stickers! This card warms my heart! I love that greeting and the little bit of bling! This card is perfect for Valentine’s Day without the typical red, pink, and white! It could be used for weddings and anniversaries too! I started with an Elegant Eggplant card base. Then I took a piece of Whisper White (4″ x 5-1/4″) and stamped the heart from the Love Sparkles Stamp Set all over in Elegant Eggplant Ink. I added this piece to the card front. For the greeting, I used the Banner Triple Punch for the fabulous banner tips. 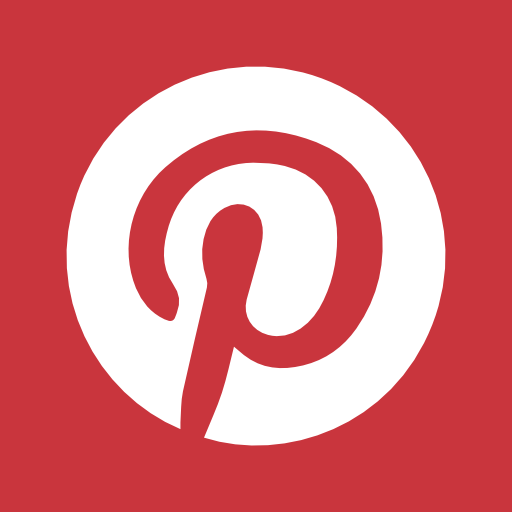 The Whisper White is 1-1/2″ wide and the Gold Foil Paper is 2″ wide. 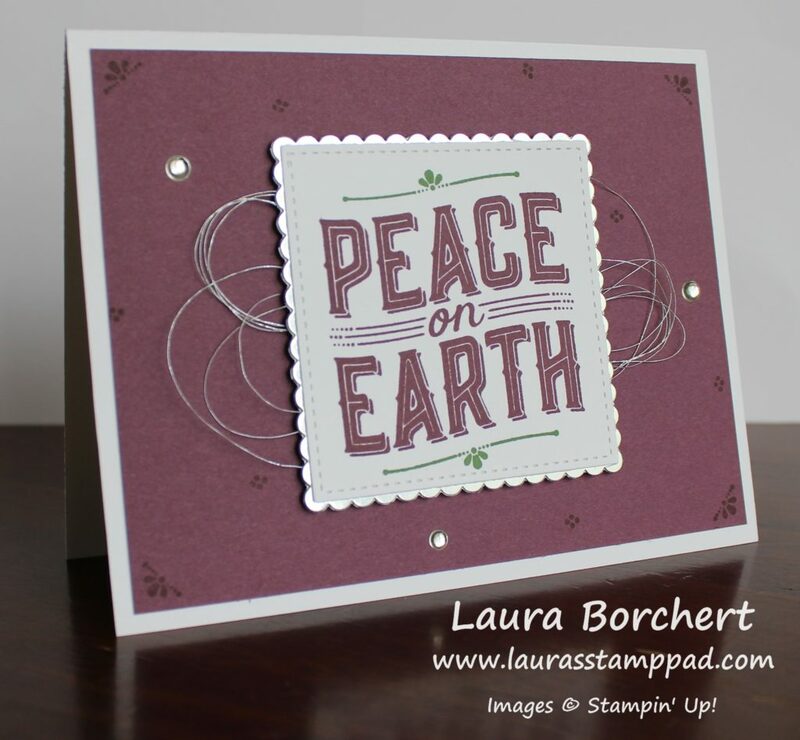 I stamped the greeting in Elegant Eggplant Ink from the Love Sparkles Stamp Set. I adhered them together and added it to the card front. 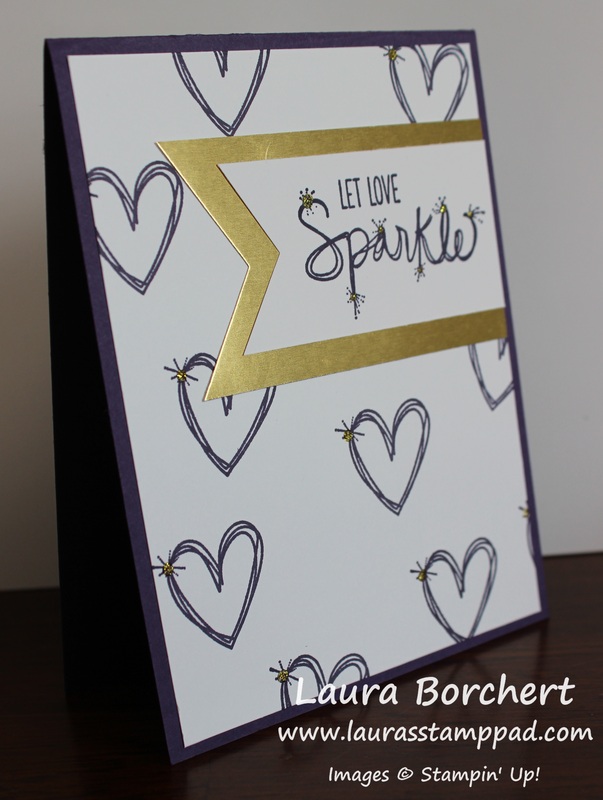 Once it was all together, I added Gold Glitz Dazzling Details to each of the little bling on the hearts and greeting! Love it! Be sure to add this after you are all done assembling so you can set it aside to dry completely. Of course I did this whole concept again with Silver Foil Paper and Silver Dazzling Details! I decided to use the star and mix up the greeting as well! I am loving this set!!! Which do you prefer Love Sparkle Hearts or Celebrate the Stars??? Let me know in the comments below! !